Wichita Tree stakes its name on customer service. One of the things that often surprises our customers is that we clean up after ourselves! After every job, we tidy up the work area by bringing an industrial wood chipper to process all of the excess branches and limbs. We can also chip old brush piles to clear up your land. Another pleasant surprise is that we can leave the wood chips behind for you to use as mulch in flower beds or around other landscaping! When you use mulch around your yard, Wichita Tree can offer valuable guidance about how to apply it, too. If mulch isn’t used correctly, it could harm plants and trees. Tip #1: if you apply mulch too heavily, it can deprive roots of much-needed oxygen. It should be laid in a thin layer loosely around the bases of the plants and trees. Plants that are layered under thick mulch can suffer greatly or even die. Tip #2: If you mound the mulch up around the base of a plant or tree, it can have the same effect. In some cases, the roots are so starved for oxygen that they will grow up out of the soil and into the mulch. Always keep mulch pulled away from the base of the plant. ​The tree care specialists at Wichita Tree can give you lots more advice on using mulch correctly. Of course, if you don’t need any mulch, we will gladly haul it away for you! 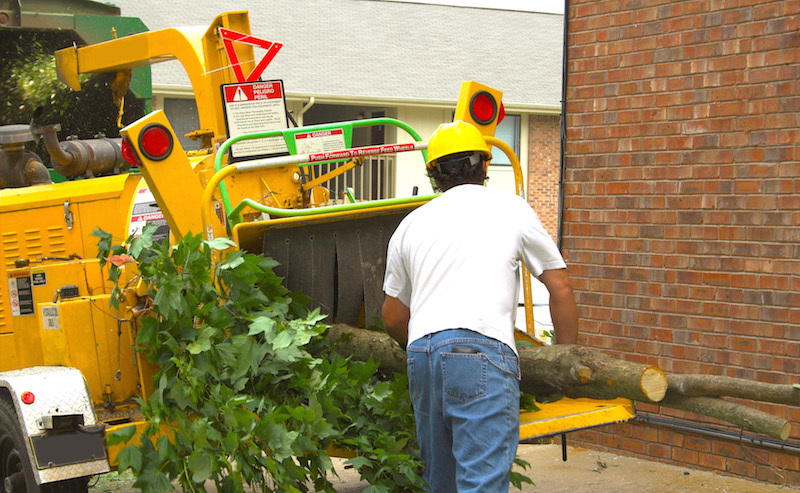 Rest assured, if you call Wichita Tree for any tree removal, pruning, or thinning, we’ll take care of the cleanup with our wood chipping services! We also offer wood chipping in conjunction with our stump removal service or if you just have old branches or limbs that need to be done away with. Call us today at 316-226-8733!